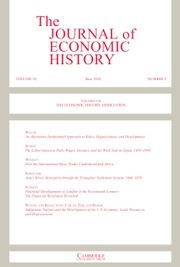 The Journal of Economic History is devoted to the multidisciplinary study of history and economics, and is of interest not only to economic historians but to social and demographic historians, as well as economists in general. The journal has broad coverage, in terms of both methodology and geographic scope. Topics covered include money and banking, trade, manufacturing, technology, transportation, industrial organisation, labour, agriculture, servitude, demography, education, economic growth, and the role of government and regulation. In addition, an extensive book review section keeps readers informed about the latest work in economic history and related fields.